Tiruchirappalli (Tamil Nadu). June 3, 2018: The Schools Sports Promotion Foundation (SSPF) Under-16 national camp for athletics concluded here today at the Anna Stadium, under the watchful eyes of a host of former internationals and ex-national champions. 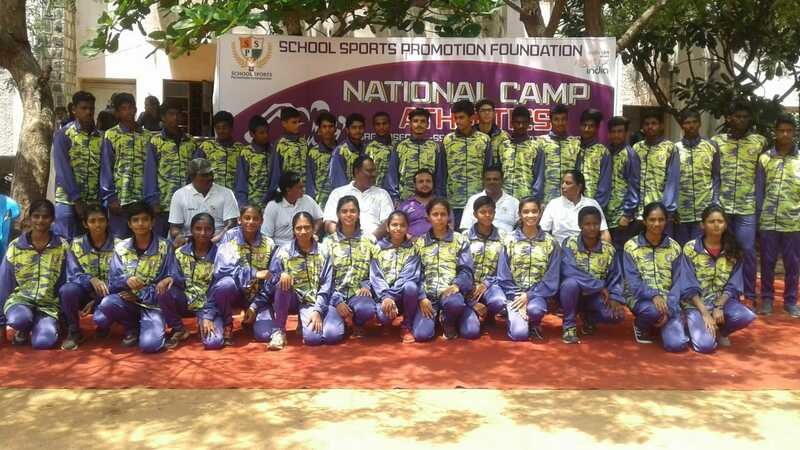 The 35 national campers, comprising of 20 boys and 15 girls were selected from the 2017-18 Schools India Cup athletics competitions, held across 11 states in India, for the camp at the ‘city of rock forts and temples’. A joint initiative of SSPF with the Sports Authority of India (SAI), the Schools India Cup seeks to identify future champions and nurture them for national and international championships at Centres of Excellence based in prestigious schools, which will provide quality education and specialised sports training for holistic development of the student-athletes. 1984 Olympian and 1982 Asian Games Gold Medalist in men’s 800m, Charles Borromeo, former National champion in men’s high jump, Nallaswami Annavi and Olympian P. Subhramanian provided mentoring and nurturing to these budding athletes, which also included a few gold medal winners from National School Games and other athletics championships for under-15. The campers participated in workshops on ‘Sports Science’, ‘How to be an Olympian’, ‘The Importance of Education for a Sports Career’. Also, present on the closing ceremony of the SSPF National camp for athletics were Trichy District Sports Officer, Mr. Velmuragin, Sports Development of Tamil Nadu, Trichy, Mr. N. Sethuraman, President, School Sports Promotion Foundation, Trichy, Mr. D. Raju, Secretary, Trichy District Athletics Association, Mr. N. Annavi, Former International Athlete and State Coordinator, Tamil Nadu for SSPF and Mr. Rakshit Arora, Sports Officer- Athletics, School Sports Promotion Foundation. In case of further queries, contact 8595333222. Boys’ Under-12: Deepak Choudhry (100m, 200m, Uttar Pradesh), Taj Rawat ( 100m,200m, Uttar Pradesh), Rithwik Kaul (100m,200m, Uttarakhand) Arjun Chauhan (200m, Long Jump, Uttarakhand), V.Sathiyamoorthi (200m, 400m, Tamil Nadu), Ram Parvesh Kumar (400m, Uttar Pradesh), N.Ajithkumar (400m, Tamil Nadu) and T.Selva Prabhu (Long Jump, Tamil Nadu). Under-15: Lalith Kumar (100m, Long Jump, Uttar Pradesh), K.Moorthy (100m, Tamil Nadu), Abinav Jha (100m, 200m, Maharashtra), T.Goushik (200m, 400m, Tamil Nadu), Bibin Ricofer (200m, Long Jump, Tamil Nadu), Deepak Kumar (200m, Hyderabad), P. Santhosh Kumar (400m, 800m, Tamil Nadu), S. Nagarjunan (400m Mts, Tamil Nadu, Prahalad Ram, 800 Mts, Rajasthan, Sourabh Singh, 800m Maharashtra), Govarthan (Long Jump, Tamil Nadu) and R. Nithish Kumar (Long Jump, Tamil Nadu). Girls’ Under-12: V.M.Kavya (100m, 200m, Tamil Nadu), Diya Nair (100m, 200m, Gujarat), Jayani R (100m, Long Jump, Tamil Nadu), Sneha Wadekar (100m, Maharashtra), Samyuktha KR (200m, Tamil Nadu), Kanak Thapraniya (400m, Uttarakhand), Miruduniya (400m, Tamil Nadu), Logeswari (400m, Tamil Nadu), Thanju H (Long Jump, Tamil Nadu) and Dhunuja Chudry (Long Jump, Uttar Pradesh). Under-15: Sri Subiksha S (100m, 200m, Long Jump, Tamil Nadu), Aiswariya Malvangar (100 m, Maharashtra), Soniya Das (100m, Delhi), Prakriti Singh (100m, Long Jump), S.Durga (200m, 400m, Tamil Nadu), Kiruthika (200m, 400m Tamil Nadu), Nevethika (400m, Tamil Nadu), Khajal Kumari (400m, Bihar), Kareena Nalli V (Long Jump, Tamil Nadu) and Ishita Sathiya (Long Jump, Maharashtra).